Former finance minister Ignatius Chombo and former Zanu-PF youth leader Kudzanai Chipanga (file photo). Former Finance Minister Ignatius Chombo and ex-Zanu-PF youth leader Kudzanai Chipanga were yesterday sent to remand prison after the court threw out their application for bail and remanded them to December 8. 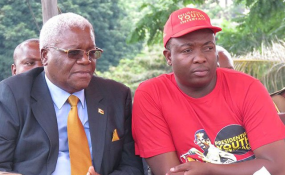 Chombo, who is also the former Zanu-PF Secretary for Administration, unsuccessfully pleaded with the court to grant him $2 000 bail and to report three times a day to the police. The pair were brought to court under military and police guard, but were not dressed in prison garb. Harare magistrates Mr Elisha Singano and Ms Josephine Sande, who presided over the cases, dismissed the pair's bail applications. The magistrates said the State managed to proffer compelling reasons justifying the continued detention of the duo. In his ruling, Mr Singano said there was overwhelming evidence against Chombo and if granted bail the public would lose confidence in the justice system. He said Chombo was likely to interfere with witnesses and investigations. "The accused person may interfere with investigations and as a former minister, he is likely to influence witnesses since some of them are his former subordinates," said Mr Singano. He said if convicted, Chombo faced a lengthy prison term and was likely to abscond trial if granted bail. "Given his position coupled with the gravity of the offence and the likely penalty, the accused might abscond as he has connections outside the country as a former minister. Inasmuch as he is willing to surrender his passport, let us not forget that our borders are porous and one can easily cross into other countries without a passport and the accused might do the same," said Mr Singano. The court further ruled that Chombo's life was at risk if released, saying he was likely to be attacked by the angry public. "The State is alleging that he abused public funds and there is overwhelming evidence. It is the court's view that even in the RBZ case, the State's case is stronger. It is documented that he used the funds for other purposes, not the intended use. These are public funds and we heard from the investigating officer that a mob wanted to attack him on Saturday when he appeared in court. This means that his safety is at risk and the only option of securing his safety is to remand him in custody," he said. Mr Singano concurred with the State that the release of Chombo would cause an outcry. In her ruling on Chipanga's bail application, Ms Sande said the court could not rule out interference. According to the testimony of the investigating officer, there was a mob at the court on Saturday when Chipanga appeared that was chanting slogans denouncing his actions. The officer told the court that the mob was shouting: "It is high time you get locked up. It is pay back time. Go and conduct your interface rallies at Chikurubi Maximum Prison." "The court is there to protect the public and the accused. The accused's security should be guaranteed for proper functioning of the justice system. Considering the Saturday incident, his safety is at risk," said Ms Sande. Ms Sande added: "The issue of his security being at stake coupled with other factors that have been mentioned by the State like interference, abscondment and the lengthy sentence proffered by the State, it is the court's view that these are compelling reasons justifying the detention of the accused person, therefore, bail is denied." In their separate bail applications, Chombo and Chipanga, represented by Professor Lovemore Madhuku, assisted by Mr Tungamirai Muganhiri, submitted that they were presumed innocent until proven guilty. They also disagreed with the State that they were on the run, but in custody as they had been abducted by unidentified State agents. "Bail should not be denied on flimsy reasons. It is unconstitutional to deny a person presumed innocent, bail. Even those facing treason charges are granted bail because bail is a right according to the new Constitution," said Prof Madhuku. Law officer Mr Edmore Nyazamba, with the assistance of Mr Tapiwa Kasema, opposed bail and called the investigating officers Superintendent Joseph Mutiforo and Detective Inspector Onismo Chikomba to the witness stand. They told the court that Chombo and Chipanga were not proper candidates for bail. They narrated how the pair tried to evade arrest. Supt Mutiforo said: "It took us eight days to find him (Chipanga) since the day he committed the offence. The way he has been playing hide and seek with us shows that the propensity of absconding is high. "If he was abducted, did he make a report of abduction? If someone is genuinely abducted, he or she makes a report against the perpetrators, but there is none." Det Inspector Chikomba said Chombo had a lot of influence and was likely to continue doing so upon release. "If released, there will be public outcry because during the demonstrations which took place recently, we heard that there were criminals around the former President (Mugabe) who were abusing public funds and this case is a good example," he said.